Shalom Y'all! We're in Israel. We are thrilled to be in Israel to attend the cornerstone laying ceremony for the Ron Nachman Memorial Site & the Pioneers Museum in Ariel, Israel. Ron Nachman founded the city of Ariel, the city King's Daughters has partnered with to give a percentage of sales, in 1978. He passed away in 2013, but his legacy lives on as a beloved pioneer for Israel settlements and fighter for Israeli freedom. His wife, Dorith Nachman, is a dear friend of ours and when she invited us to come for the ceremony and for Sarah to sing Peace Over You at the event, we couldn't say no. Of course, while we are in Ariel, we will be seeing progress on our A-Z Philanthropies in the city . We are especially excited about is teaching an Art Class at the Warm Home, an after-school program for at risk teenage girls in the city. King's Daughters helped start the home in 2011 by committing to give a percentage of every sale to the project. It is now a thriving philanthropy in the city today. We are joined by the wonderful, courageous, talented Audrey Lero. She came to Israel with us in May 2015 and caught a vision to write a book about the life of Ron Nachman. I will let her share the details on that later, but she is giving her time, talent, and treasure to record the life of Ron and share his legacy with the world. WOW! So here we are, King's daughters - praying for the peace of Jerusalem with every step and enjoying time in the apple of God's eye. We invite you to join our trip by enjoying our daily photo recap of this Israel trip! Little praise story to share! We arrived in Jerusalem late at night and found the most AMAZING hummus restaurant while we waited for our hostess to open the apartment we rented. We invited her to eat with us and, with great joy, saw her face light up when we told her about our mission in Israel and our heart for the people. I would say one of the highlights of our trips to Israel is to converse with the people and tell them that there is a large group of Christians standing with, praying for, giving to, and loving Israel. In a world where stereotypes and news stories can taint our view of the world, a huge part of our time here is taking every opportunity to tell Jews, "We love you! We honor you as the roots of our faith. We are invested in your country. We are praying for your peace." They look at us in surprise and gratitude...knowing Christians by our love. Beautiful walk from Jaffa road to the old city. MORNING CLASS: What an experience! We joined a free Torah class Aish Hatorah with the enthusiastic Rabbi Geller. He taught from the daily Torah portion with wisdom, insight, and energy! We loved every minute! MORNING PRAYERS AT WESTERN WALL: What a reverent place to be surrounded by every tongue and tribe crying out to the Lord. Jeremiah 33:3 came to my heart while praying at the wall: "Call to Me, and I will answer you, and show you great and mighty things, which you do not know.’ Also see below the colorful walk through the Old City as you walk to and from the Western Wall. THE ISRAEL MUSEUM: Dead Sea Scrolls, Temple Replicas, Judaica, Israeli Art, and more...oh my! 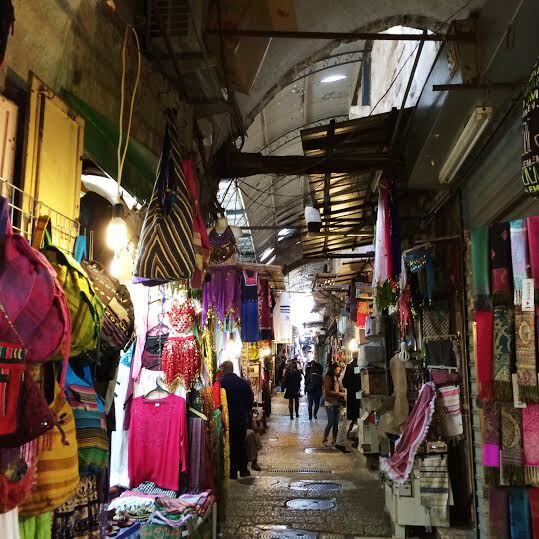 MAHANE YEHUDA MARKET: Bustling with shoppers getting their groceries before Shabbat, Friday afternoons are one of the most exciting times to be at the Market. It is truly a 5 senses experience with all the international foods, people, restaurants, grocers, families, and goods crowded into 3 tiny streets. STROLLING THROUGH JERUSALEM STREETS. One of my favorite activities in the city! SHABBAT DINNER AT RABBI MACHLIS: Out of respect for Jewish customs, we were not allowed to take pictures at the dinner. But please just picture 100 people crowded into a tiny apartment sharing a meal together. The Rabbi is teaching from the Torah portion, Jewish men and women are singing enthusiastically in Hebrew, people from every nation are meeting, babies are crying, food is being passed over your head...there is beautiful chaos enjoying the hospitality of the Machlis family and an authentic Shabbat dinner. NEW FRIENDS IN JERUSALEM: We just love divine appointments. We ended our day making friends with Israeli Messianic Jews who shared their testimonies of how they came to know Jesus as Messiah. What an awesome experience to hear how their hearts came alive knowing God in such a personal way through Jesus Christ. One of my favorite things said was, "I talked to God and I actually heard a voice back. I had never had that happen in my life. I am so hungry for more." Amen! We hope you enjoyed Day 1 in Photos. Also follow @kdcelebrate on instagram for daily pictures.